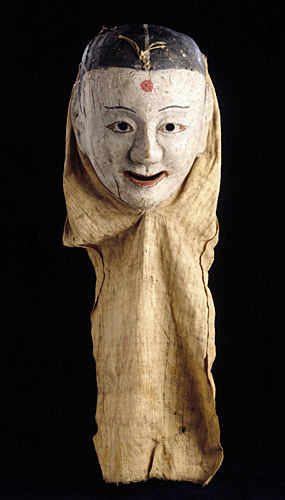 This mask is made out of wood and covered in light beige fabric (like the seven others collected by the Varat Mission and which are now in the Musée Guimet). On top of the original, delicately-nuanced polychrome paint, two further coats have been added at a much later date. The artefact depicts a perfectly oval female face. The pronounced line of the eyebrows and the black hair contrast with the extremely pale complexion; the sole touch of bright color is a red spot on the forehead between the eyes. The figure no doubt represents the young female shaman (“Somu” in Korean) as she was personified in the Sandae masked theatre on the occasion of the festivities to mark the feast of Tano (held on the fifth day of the fifth lunar month). In Korea, under the Yi dynasty (1392-1908), the Sandae was a court theatre, placed under the patronage of the king and, for a while, administered by the governmental office specifically responsible for organizing court entertainment and official festivities. According to the French explorer Charles Varat, whose anthropological findings were published in “Le Journal des Voyages” in 1894, it would appear, however, that these wooden masks were more commonly used in funeral ceremonies. Their purpose was to ward off the baleful influences that accompanied death, and to protect the living from evil spirits. During burials, the role of the dancers-attired in tragic costumes and masks-was to prevent the “malevolent spirit” from escaping. Once the ceremony was over, the “benevolent spirit” was housed in a small, precious receptacle in order to safeguard family members of the deceased. Besides their prophylactic powers, such masks accurately mirror the Korea of their day. They exhibit a genuine sense of humour and portray, often in an extremely refined and poetic way, a broad tapestry of Choson people and society.